The global barrier shrink films market is predicted to be impacted by three key trends, i.e. the mounting demand for shrink films, increasing requirement of polylactic acid (PLA) films, and rising engagement of sustainable packaging. Most of the barrier shrink films are made of polyolefin and polyethylene (PE) plastics, provide UV protection, and offer affordability, which make them one of the best buys in the industry. PLA films could gain traction while riding on the surging demand for biodegradable packaging solutions. Sustainable packaging is expected to up the demand in the market as it gains larger importance with the vast amounts of packaging waste created. 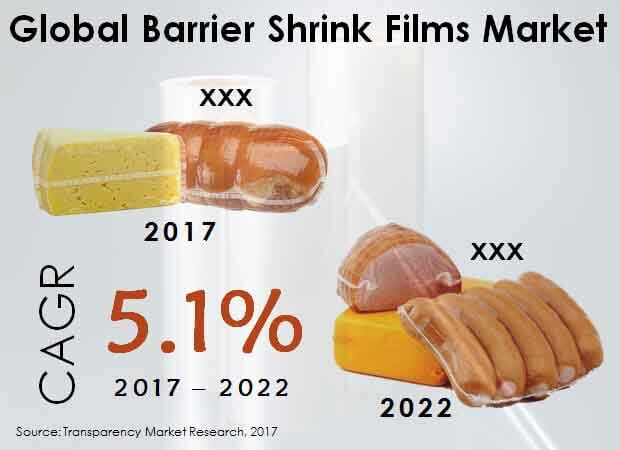 The global barrier shrink films market, as envisioned by Transparency Market Research (TMR), could touch a revenue valuation of US$4.5 bn by 2022 from a US$3.5 bn reached in 2017. Between 2017 and 2022, the market could rise at a 5.1% CAGR. The international barrier shrink films market is envisaged to offer ample of growth opportunities on the back of the rising popularity of transparent products that provide protection from aroma, moisture, gases, and dust apart from transparency. Nonetheless, there could be more products such as multilayer high barrier shrink films making a mark in the market with their design prepared using innovative proprietary technology. These films could be used for applications that necessitate maturation or long shelf life. Features such as environment friendliness, cost reduction, high strength, clarity and gloss, high barrier, and excellent sealability and overlap are projected to help the films to make the cut in the industry. The international barrier shrink films market is foreseen to see a classification as per product, end use, material, and barrier. By product, the market could be segmented into flowpacks, vacuum bags, shrink forms, chubs, and shrink wraps. According to the analysis of the report, vacuum bags could be a top segment of the market prophesied to secure a 27.9% share by the end of the forecast period. On the basis of end use, the international barrier shrink films market could see a segmentation into food and beverages, healthcare, electronics, cosmetics and personal care, and other manufacturing end users. By material, there could be vital segments such as PE, polyethylene terephthalate (PET), polypropylene (PP), polyamide (PA), ethyl vinyl alcohol (EVOH), and others. In terms of barrier, low, medium, high, and ultra-high barriers could be among the important segments. By geography, the international barrier shrink films market is foretold to testify the lead taken by Asia Pacific Excluding Japan (APEJ) that grabbed a 34.8% share in 2017. On the slower side of growth could be Japan and the Middle East and Africa (MEA) with little to offer for players looking for rewarding prospects. However, Europe and North America are projected to exhibit a striking growth in the foreseeable future. The worldwide barrier shrink films market is forecast to be contributed to by companies such as Bemis Company, Inc., Sealed Air Corporation, Winpak Ltd., Kureha Corporation, Coveris Holdings S.A., Schur Flexibles Group, Flavorseal Llc., Buergofol GmbH, Flexopack S.A., and Premiumpack GmbH.